Four weeks into the season and the MCRC keeps rolling! 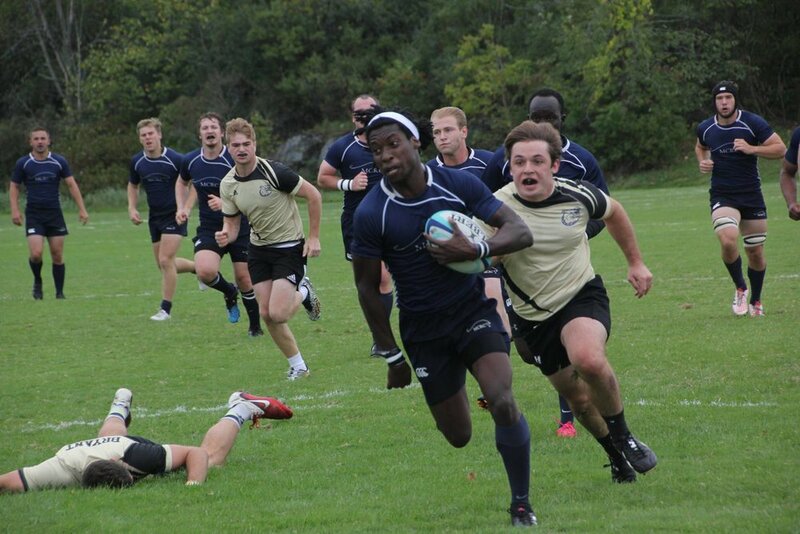 A week ago the Blue hosted their home opener against Bryant University. In front of a sizeable crowd the MCRC put on a show. The dominant Blue pack consistently gave the backs good ball allowing for plenty of tries against the Bryant defense. Tries came from scrummie Munya Munyati (‘20), lock Alex Hogenhuis (‘19), lock Campbell Boswell (‘19), and wingers Trevor Hopkins (‘20) and Lukas Cesena (’19), who were tied for league leading try scorer with six tries a piece after the game. Conversions came from both Munya Munyati and Kwame Mukasa and the MCRC defense only gave up one try. The final score for our home opener was 42-5. This past weekend the MCRC made the trip down to Waltham, MA to play its toughest competition yet, Bentley University. Both Bentley and the Blue were undefeated going into the game but the MCRC came out victorious in a 17-7 battle. On what felt like a summer day, Campbell Boswell and Trevor Hopkins snuck into the try zone for the Blue and Kwame Mukasa kicked for points. The Blue are now 4-0 going into the last three regular season games, all at home. Parents Weekend on Oct. 14th brings Stonehill College, followed by Southern Connecticut College on Oct. 21st, and finally Homecoming and Alumni Weekend which brings Norwich University on Oct. 28th. Older PostThe 2017 Fall Season has Begun!